I am not a Bachmann supporter or hater, but there is nothing here worth reporting on or blogging about or whatever it is you do. So she registered a business for 2 years - so what? And the "missing years" seem not to exactly be some watergate event. Was she a stay at home mom? Was she ice fishing? Was she stitting on a couch watching soap operas? Who cares, what does it matter and why would a grown man waste 13 paragraphs and 1000 words on this? If you were as concerned about the missing history of say our sitting President, you might actualy have something worth reading. I don't know, FG, I think a seven year blank spot in the life of a presidential candidate where a business has been registered but never mentioned again is something to wonder about. Many candidates run on their business successes. Shouldn't we know about business failures? $67,000 in revenue reported and conflicting listings of the type of business should raise red flags at least with the IRS! You do that FG and I guarantee they would be all over you wanting some facts. I sense you are a Bachmann fan if you think nothing stinks about this! You'd think that mediation would be a positive skill and experience for President. Certainly more than a "pray away the gay" business. Hardly a non-story, as the first commenter claims, this should definitely be investigated further. If the Bachmanns have been overly creative with tax deductions, this is a serious offense to taxpayers - not to mention a crime. Furthermore, for someone who called for an "investigation of every member of Congress" to think she can say what is and isn't off limits is ludicrous. We can not allow mainstream media to let her get away with that. Lies are bad enough; criminal activities are punishable by law. A candidate for the highest office in the land should be above reproach and as clean as the board of health. Period. Anyone who has a problem with that should examine their own background for lapses in judgment. I want the 3 min of my life back that I wasted from reading such nonsense! Michelle Bachmann is a habitual liar. Either that or she's an idiot that has no idea what she's saying or what's doing at any given time. So to all you Bachmann supporters out there, which is it? Idiot or liar? As CEO of Mediate.com and someone familiar with nearly every mediator in the country, I have no knowledge nor record of Michelle Bachman providing mediation services. If you are running for President, it has always been the province of the press to examine the candidate's life. This is a legitimate story, in spite of the fact that she is an illegitimate candidate. For anyone who has been paying attention Michelle Bachmann is shocking ignorant of middle school history and geography, a colossal fraud, serial liar, and shameless hypocrite. It is obvious she will say anything to pander to her "tea party" nut wing base. If she or Perry get elected I'll gladly move to Panama. 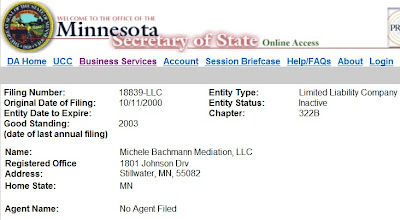 I think this is interesting, particularly as from time to time Bachmann or someone acting for her apparently has deleted all mention of her time as a litigating attorney as well from sites like wikipedia and her congressional bio. It seems to be a claim that made her uncomfortable. I'm guessing her claims of having worked on hundreds of cases for the IRS will turn out to be like her 'raising' 23 children, for only a week or two. That litigating attorney stuff is information that comes and goes. I'd also love to see someone press Marcus Bachmann for more details about his supposed PhD in Clinical Psychology from the dubious academic entity that didn't offer such a degree. I hope whoever asks, if they can get an answer, will also find out how much clinical time he spent at the school, or was it entirely a correspondence degree. 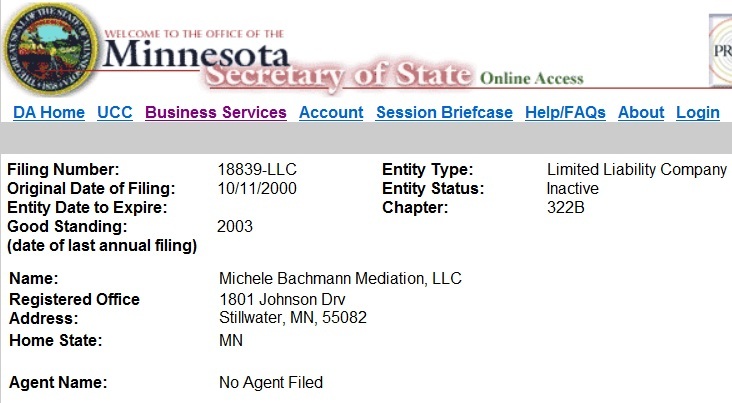 I wonder if that $67,000 attributed to Bachmann's mediation business was real money or funny, made up money intended to make her look more successful? And was it reported to the IRS? Because I'm unwilling to take things at face value from the can't-tell-the-truth-Bachmanns. I found this post when I was looking for tax advantages, etc. Michelle Bachmann made off her foster children. If I understood what she just said, she "infiltrated" the IRS to see what the enemy was up to. Sounds to me like she and her husband set out, like a lot of astute rich people do, to play the system for all its worth. What better ways to do it than to become a tax attorney. If it weren't for the likes of Warren Buffet, I'd have a real hard time with the "rich" people. If she claimed $67,000.00 in income you can be sure she made $75,000 or more. Anyone know who cooked, cleaned and cared for those 23 foster children as well as her own children? Apparently, we now have a "supermom" like nothing we have seen before. Didn't the Wm and Mary credentials turn out to be a weekend semeniar? 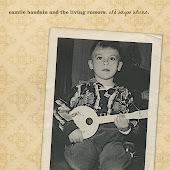 Superb blog!!! I have spent here many of time to read about Michele Bachmanns. 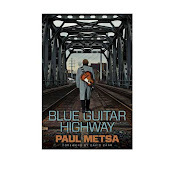 That's nice surfing for me on google. Thanks.